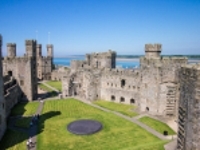 Situated in North Wales, across the Menai Strait from the Isle of Anglesey, is Caernarfon, dominated by the walls of its 13th-century castle. It was here, in 1969, that Prince Charles' investiture as Prince of Wales took place. It was a dramatic event marked by pomp and ceremony, and had the strong symbolic impact of strengthening Britain's dominion over Wales in this staunchly nationalist district. Across the strait is Anglesey, which is probably most noted for the town of Llanfairpwllgwyngyllgogerychwyrndobwlllantysiliogogogoch, which has the longest place name in the United Kingdom, and quite possibly the world. The name, when translated into English, means 'The church of St Mary in a hollow of white hazel near a rapid whirlpool and near St Tysilio's church by the red cave'. The island of Anglesey was the crucible for pre-Roman druidic activity in Britain and many mysterious Neolithic ruins remain. Caernarfon has also been inhabited since pre-Roman times. Those on their way to catch the Irish ferries at Holyhead, usually rush through Anglesey and Caernarfon, missing out on its spectacular coastal scenery of sandy coves and rocky headlands. Apart from the imposing fortress, Caernarfon boasts some lovely little craft shops and good restaurants.